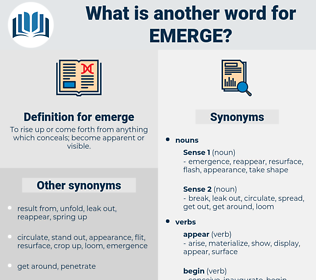 What is another word for emerge? To rise up or come forth from anything which conceals; become apparent or visible. Originated, are, formulated, arise, occur, come, emanate, manifest, derive, demonstrate, reveal. 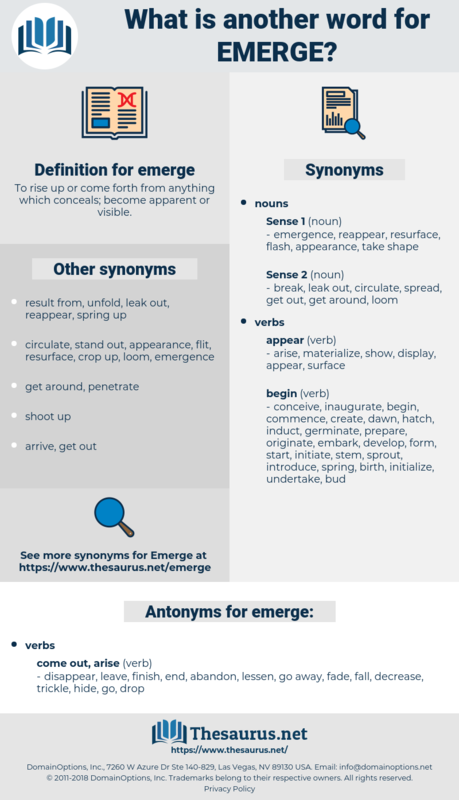 arise, cases, occur, resurface, come, exit, reappear, overcome, originate, emanate, erupt, evolve, recover, ensue, escape, materialize, exist, depart, manifest, derive, accrue, extricate, demonstrate, forge, be, reveal, highlight, materialise. disappear, leave, finish, end, abandon, lessen, go away, fade, fall, decrease, trickle, hide, go, drop. But when they saw the unknown figure of a man emerge, scared by his strange appearance, and thinking that the dead had come to life again, they flung down the rope and fled. As they rode into camp the very first man to emerge from Casement's tent, with his habitual smile, was Bob Scott. emery rock, enrage, energise, enuresis, energy, energize, enrich. come up, surface, rise, rise up.